Thousands of commuters, including government employees and techies, on Monday boarded the new metro line between north and south of the city. BENGALURU: Thousands of commuters, including government employees and techies, on Monday boarded the new metro line between north and south of the city, saving time and avoiding the vehicular traffic-choked roads. 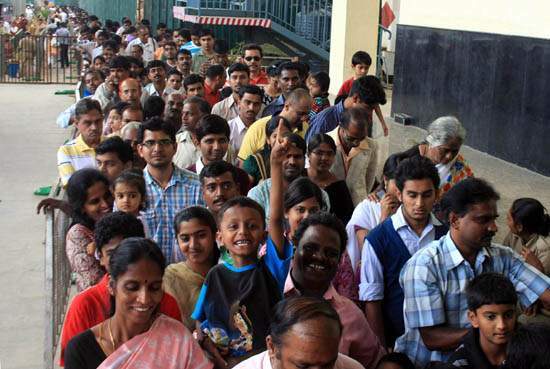 "About 75,000 people used the 24km north-south route (green line) between 5 a.m. and 6 p.m. to commute on the first working day of the week after the service was opened to the public on Sunday," Bengaluru Metro Rail Corporation Ltd (BMRCL) spokesman U.A. Vasanth Rao told reporters here. About 130,000 people commuted on the 19km east-west (Purple Line) route during the same period, with many of them inter-changing to the north-south route and the vice-versa at the underground Majestic Station terminal in the city centre. "It was convenient for me to commute from Baiyappanahalli in the east to Sampige Road in the north-west by swapping metros at Majestic," M. Rekha, a homemaker, told IANS after a hassle-free ride, saving time from travelling in crowded state-run buses during peak hours.President Pranab Mukherjee on Saturday flagged off the new service line between Sampige Road and Yeachanahalli in the south through Majestic, dedicating the 43km first phase of the metro rail system to the city. With the service frequency at five minutes during peak hours, the inter-changing terminal at Majestic teemed with thousands of commuters, many of them taking time to hop from one platform to the other below it in the underground station.Many commuters who had to inter-change trains at Majestic station were at loss to find their way from one platform to the other, which was further below in the underground. "Though sign boards in English and Kannada have been placed at all the four platforms for inter-changing from Green Line to Purple Line and the vice-versa, many commuters, especially first-timers were confused on going where and boarding which train for onward travel," admitted Rao, saying enough staff had been deployed to guide the public. "We are bound to be confused at the inter-changing station as we are not used to it. It will take us time to get to know the service better," said Sowmyaa Shankar, a sales executive, commuting to Yelachanahalli from Majestic.Metro service on both lines operate daily from 5 a.m to 11.30 p.m with five-minute frequency during peak hours and 10-minute frequency during non-peak hours. The phase one of the metro network has 8.8km underground stretch on both corridors while 33.5 km is over ground.The service on the north-south route runs 4 km underground from Sampige Road station to National College via Majestic and covers the entire line in 45 minutes, with 30-second halt at each of the 24 stations enroute. The service from Sampige Road to Peenya Abegan had started in March 2014 and from Peenya to Nagasandra station in May 2015.Though the phase one project work began in April 2007, the original deadline was extended to 2017 from 2010 owing to inordinate delays and cost overruns. The first metro service began in October 2011 between M.G. Road and Baiyappanahall, while the east-west corridor, which connects Baiyappanahalli station to Mysore Road station in the west in 35 minutes, has been operational since April 2016.